Rapid advancements in data extraction and technology mean information technology (IT) is changing at increasing speeds, too. Organizations across all sectors have now centred their strategies on extracting the most out of the digital transformation, which is why information technology now sits at the center of the spectrum involving this transformation. One of the chief concerns for IT leadership is extracting value that they can make sense of from their data. Data is primary to the venture of digital transformation, which is why organizations have centered their interests and concerns around it. Client behavior is constantly changing and available data studies this behavior and can help organizations better cater to client needs. Since data is key for gathering these insights, the process of gathering data holds an imperative position in the data cycle today. Organizations have realized the importance of data and have made required additions to the C-suite to account for it. The Chief Data Officer (CDO) is the newest addition to the C-suite of employees as many futuristic organizations have put their attention on data and the complexities surrounding it. The need for a CDO has arisen because of the need for large organizations to adapt to the changing requirements. Such organizations faces numerous technological and data-driven disruptions. These disruptions can prove to be challenging if the organization doesn’t have relevant managers and officers in place at the senior level. This is where the CDO comes in. Next to a CIO, his/her role is to champion a data-driven work culture, and to signal future changes including challenges and complications that will arise. The Chief Data Officer (CDO) and the Chief Information Officer (CIO) are two different C-suite roles required within different domains of the organization. Just like Chief Marketing Officers (CMOs) and Chief Financial Officers (CFOs), both of these executives have distinct and clear responsibilities. The CIO is the traditional executive position. Having been around for decades, the position is well established and oversees the IT department, among many other things. The CIO is in charge of all the data and systems of the organization, and is responsible for leading the business intelligence initiatives of the organization. A contemporary CIO is also responsible for looking after the data and the insights generated from it by the organization. The CDO is a much newer role, and refers to executives tasked with looking after the insights and analytics generated from data the organization is able to collect and/or access. The role and position for a CDO came into being when organizations began to realize how important it was to work on their data resources and unearth its actionable insights. The CDO has a clear focus on data and is responsible for extracting as much value as possible from all of the data resources of the organization. Managing the data quality and governance are just some of the roles that fall under the CDO. Ultimately, their goal is to work on data quality and envision what the data should look like and how it can be further manipulated to reach that stage. Many leading organizations across the globe have ramped up their data budgets and started hiring CDOs to allocate that budget to. Companies now treat data as an asset that needs to be duly looked after by a CDO. A recent study by Gartner suggests that almost 90 percent of all leading global organizations are expected to have a CDO by the end of 2019. We are already seeing progress towards this number, as organizations have started adding to the C-level suite by hiring CDOs. 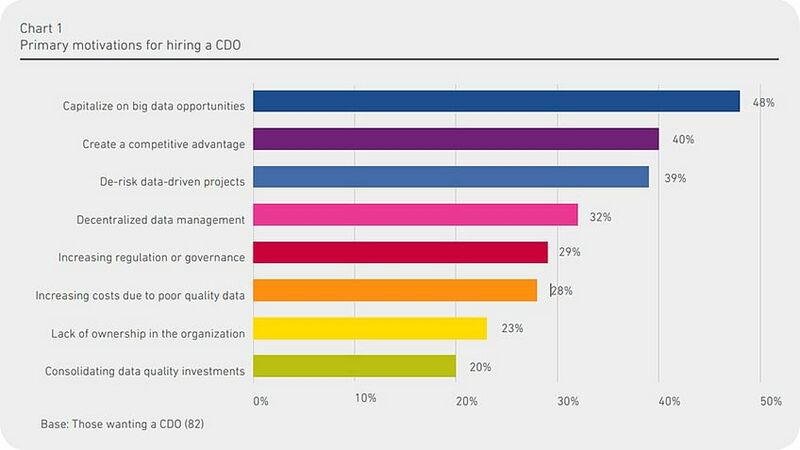 In 2012, only 12 percent of companies had a CDO in place. This percentage grew to a staggering to 56 percent in 2017, and 63 percent in 2018. This means that not only are organizations hiring more CDOs, but they have huge responsibilities already lined up for them. Since responsibilities of the CIO and CDO can overlap, there were some initial concerns that there could be tension between these roles in an organization. However, in practice this hasn’t been an issue, as a recent research commissioned by Experian Data found out that around 82 percent of all CIOs believed that there was a compelling case for them to hire a CDO in their organization. The CDO wasn’t just required to distribute responsibilities, but also to help leverage the data-driven objectives of the organization. The potential for tension to arise between CIOs and CDOs also depends on where the new CDO is coming from. Both these executives would have better synergy with each other if the new CDO is from the IT department, because data as a whole is more intertwined with the IT department. However, if the CDO is coming from the marketing department, these executives may find it hard to be on the same page. Just like the constantly changing and evolving landscape of data, the role of the CDO will also keep changing and evolving over time. These changes will bring about innovative methods, as organizations leverage new techniques for utilizing resources. The skills a CDO requires include data visualization, regression models, knowledge of statistics, hypothesis testing, clustering, decision trees, linear and logistic regression, and much more depending on the organization and industry, which makes training such as the Data Science Masters Program an ideal foundation from which to start in this field.